ABC Final Show will showcase the yearlong efforts of youth enrolled in ArtSouth’s 2017-18 after school programs at Gibson Bethel Community Center and Mt. Olive Baptist Church. 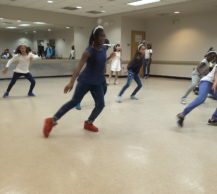 The public is invited to enjoy South Miami Community Redevelopment Area’s youth performing in front of a live audience in a professional venue. Join us at Unitarian Universalist Congregation 4-6pm Friday, May 25.